Canvassing books were used by salesmen who went door-to-door taking orders for books. These books are multi-function tools. The front and back covers displayed two of the binding styles available for purchase. Other versions were adhered to the inside, which also showed sample pages and illustrations. Some included a cheat-sheet with pitches to highlight all the special features and increase sales. In the back of the book the agent filled in order sheets with the name, address, and binding style that the customer wished to purchase. This book was offered in three binding styles: cloth with black and gold stamping, an embossed leather version and—the most expensive—“French Morocco, superb raised panel, half antique, gilt centre and edge” for $6.25. This was an unusual binding for this subject matter, since panel bindings are seen more often on Bibles. 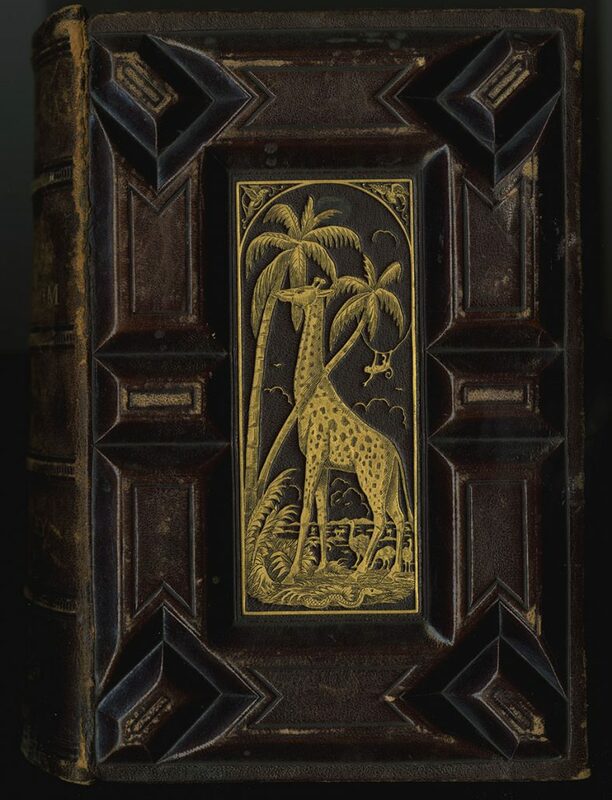 The gold stamped scene of the giraffe and the little monkey swinging from the palm tree is delightful. 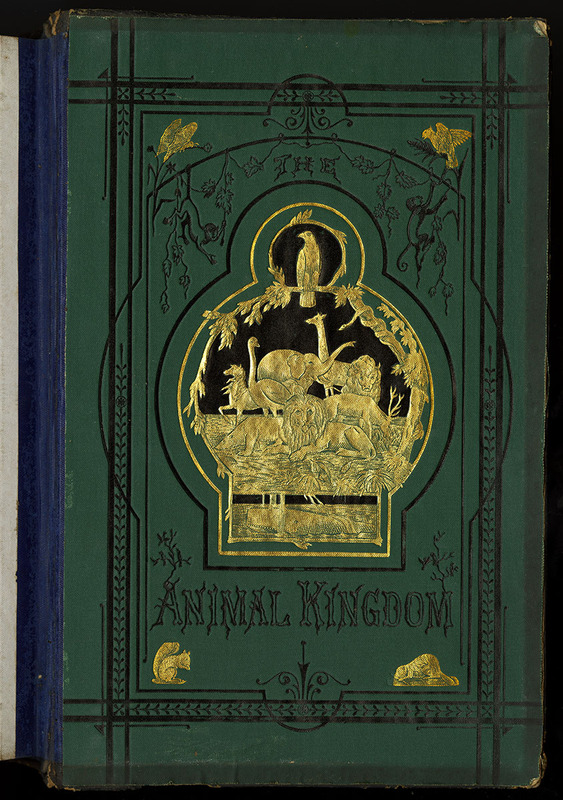 The Animal Kingdom (Philadelphia, 1880). Canvassing book. 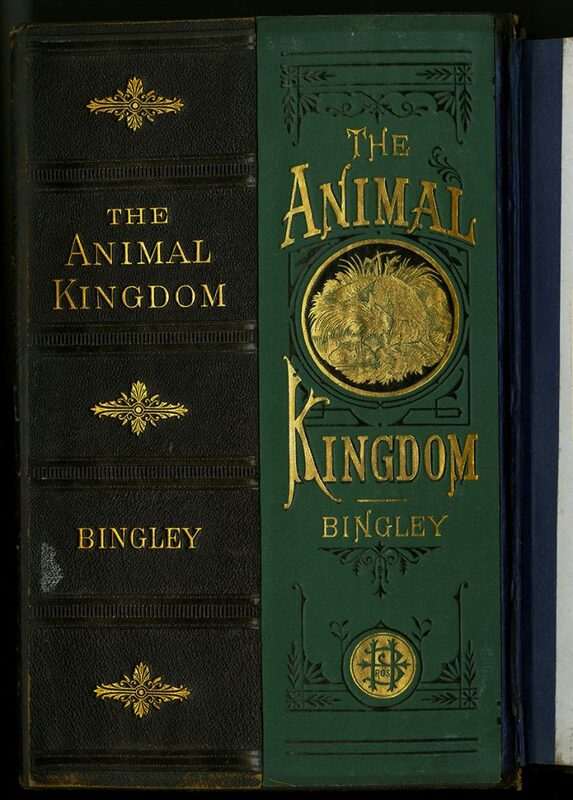 The Animal Kingdom (Philadelphia, 1880). Michael Zinman Binding Fund. 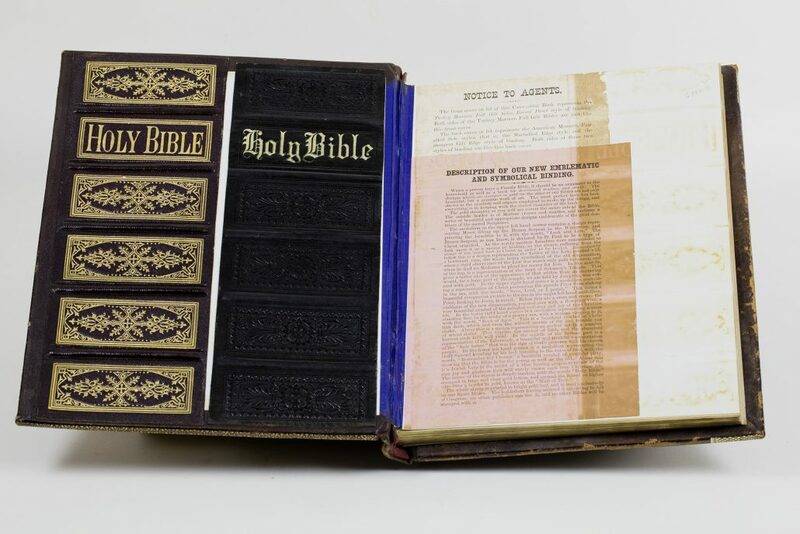 New Devotional and Explanatory Pictorial Family Bible (Philadelphia, 1879). Canvassing book. Michael Zinman Binding Collection. This canvassing book was meant to show four binding styles. 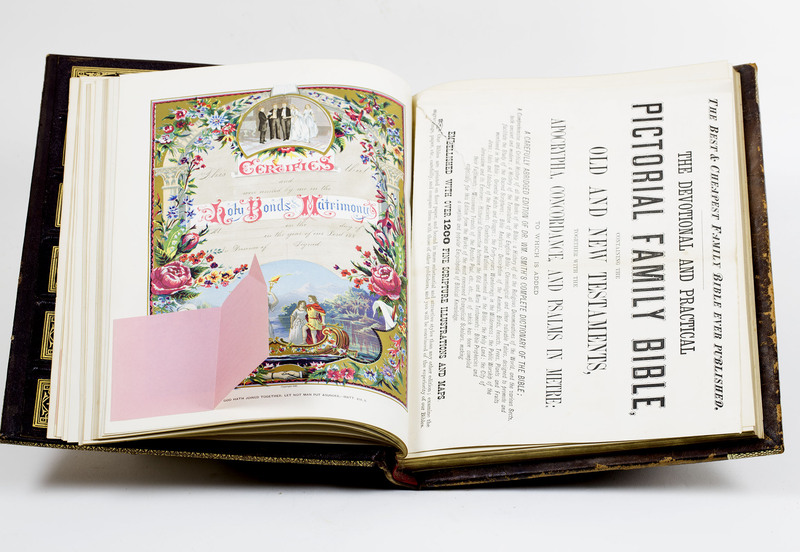 Bound into the book are samples of engravings, a family record page, photograph album pages, a marriage certificate, and some dictionary samples. These special pages have pink notes attached with a script for the canvasser to use in his pitch. The one shown here goes into great detail about the most expensive Bible on offer, each “medallion” described in effusive detail. John C. Winston & Co. Photographic Bible Prospectus (Philadelphia, ca. 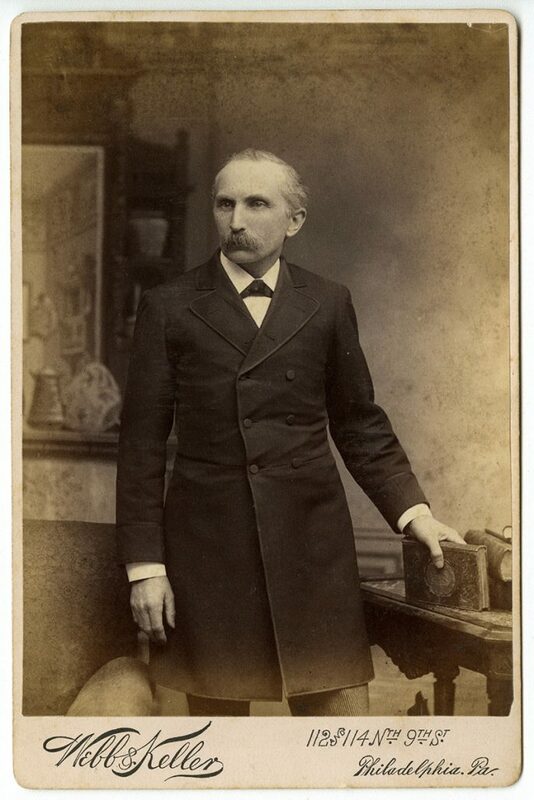 1904). Michael Zinman Binding Collection. 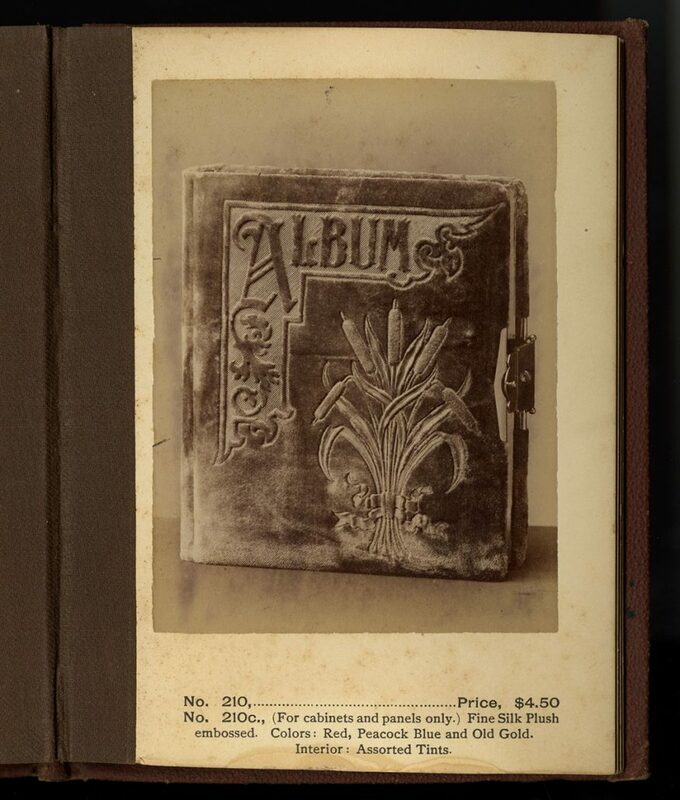 Instead of samples, this book contains photographs of Bibles and also photograph albums. This allowed the salesman to show even more variety than a typical canvassing book. The cloth “plush” albums came in several colors and it is interesting to consider what “Peacock Blue” and “Old Gold” looked like. John C. Winston & Co. “A New Line of Subscription Photograph Albums” (Philadelphia, ca. 1904). Reproduction of broadside attached and folded into Photographic Bible Prospectus. National Publishing Co. “To the Agent.” (Philadelphia, 1879). Not to be confused with the gift books, G.G. Evans combined a retail shop and lottery to sell remaindered books. Each purchase came with a free “gift” that was chosen randomly by an Evans employee. The gifts had a purported value of twenty-five cents to one hundred dollars, but most were just cheap trinkets. For the customer, there was always a tiny chance that buying an inexpensive book would result in getting one of the most valuable gifts. In some ways it was similar to gambling, and gift book establishments went to great lengths in their catalogs to defend the morality of their operations. 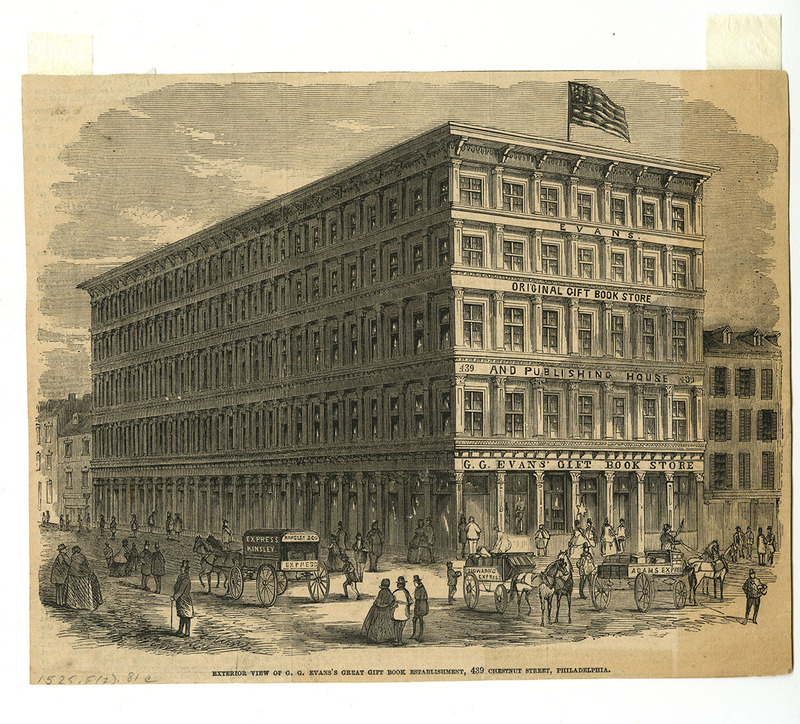 During the late 1850s and early 1860s, there were five gift book establishments in Philadelphia and agents sold for them in the smaller towns. G.G. 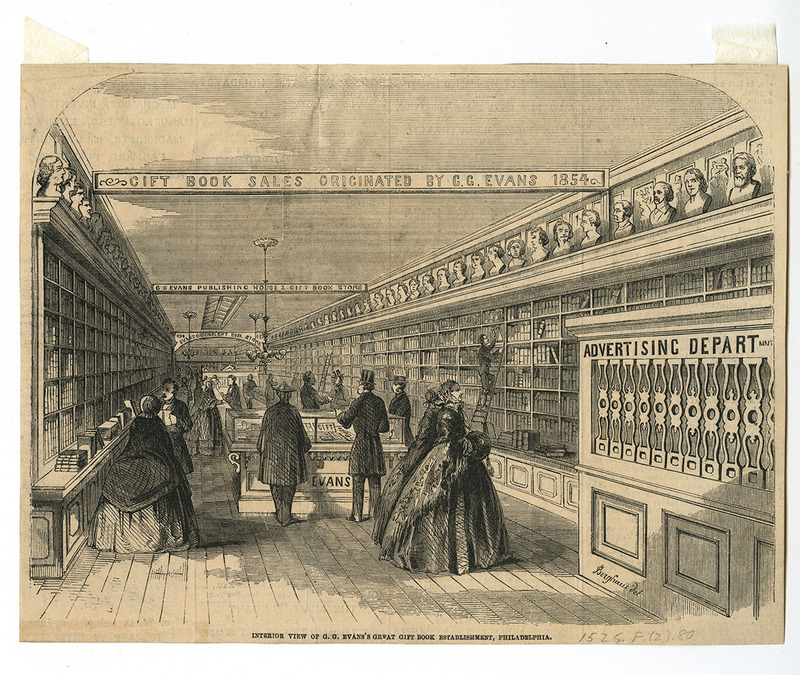 Evans was the biggest and—as he continually argued in his broadsides and catalogs—the first gift book establishment in the United States. 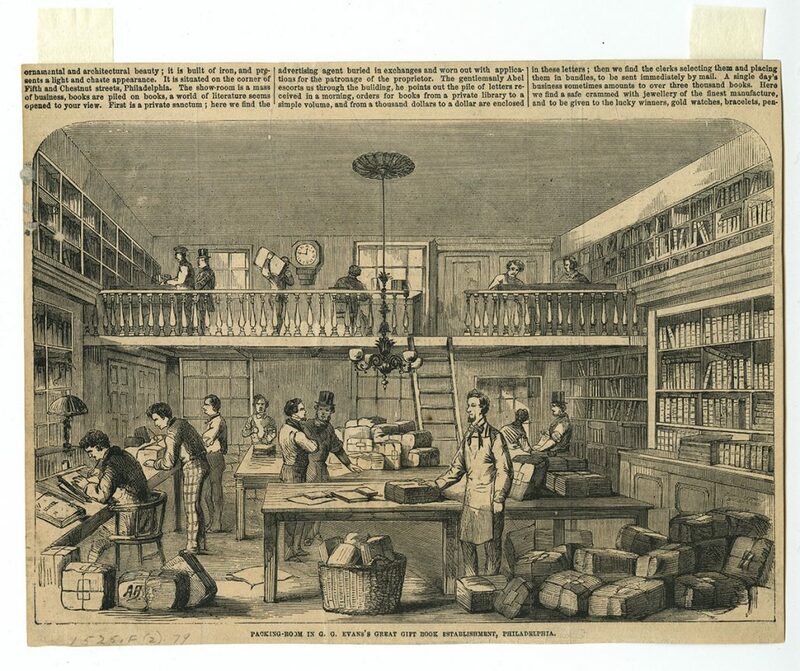 Images of the interior of his store depict an elegant showroom with busts of famous writers and well-dressed men and women perusing the books and gifts. This gave the impression of sophistication and legitimacy, when it was actually a somewhat tawdry operation. G.G. 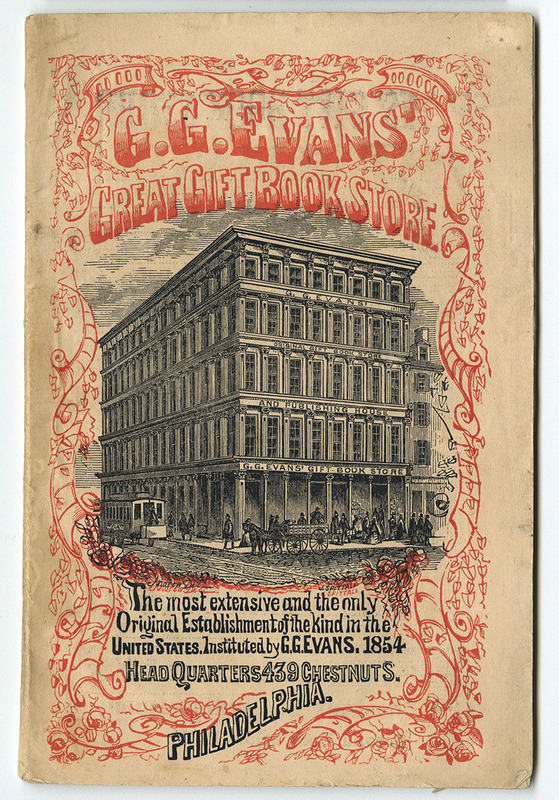 Evans’ Great Gift Book Store (Philadelphia, 1859). Gift of David Doret. G.G. Evans’ Celebrated Gift Book Store and Publishing House (Philadelphia, ca.1859). This broadside shows an interior view of G.G. Evans showroom and a “Schedule of Gifts.” It is interesting to note that the books are listed on the other side, implying that they were not as important as the gifts. Interior view of G.G. Evans’s Great Gift Book Establishment, Philadelphia. From Frank Leslie’s Illustrated Newspaper, December 31, 1859. Exterior View of G.G. Evans’s Great Gift Book Establishment, 439 Chestnut Street. From Frank Leslie’s Illustrated Newspaper, December 31, 1859. Packing-Room in G.G. Evans’s Great Gift Book Establishment, Philadelphia. From Frank Leslie’s Illustrated Newspaper, December 31, 1859. 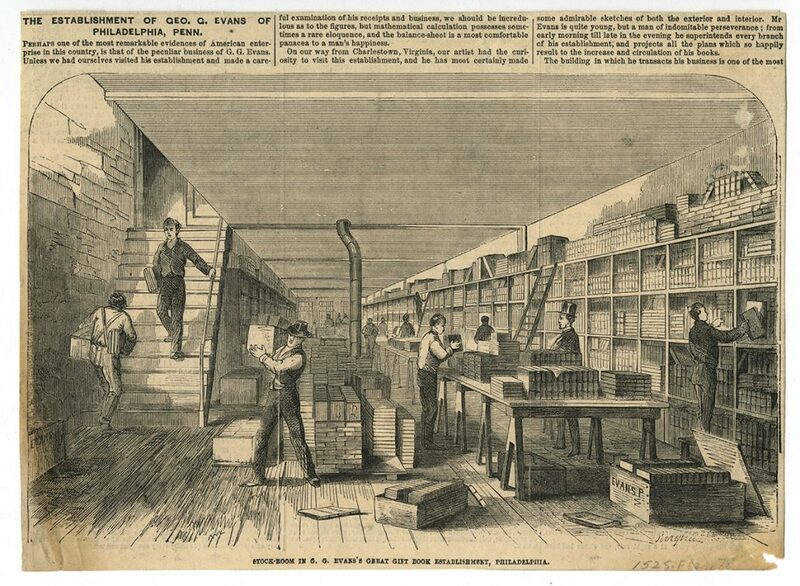 Stock-Room in G.G. Evans’s Great Gift Book Establishment, Philadelphia. From Frank Leslie’s Illustrated Newspaper, December 31, 1859. G.G. 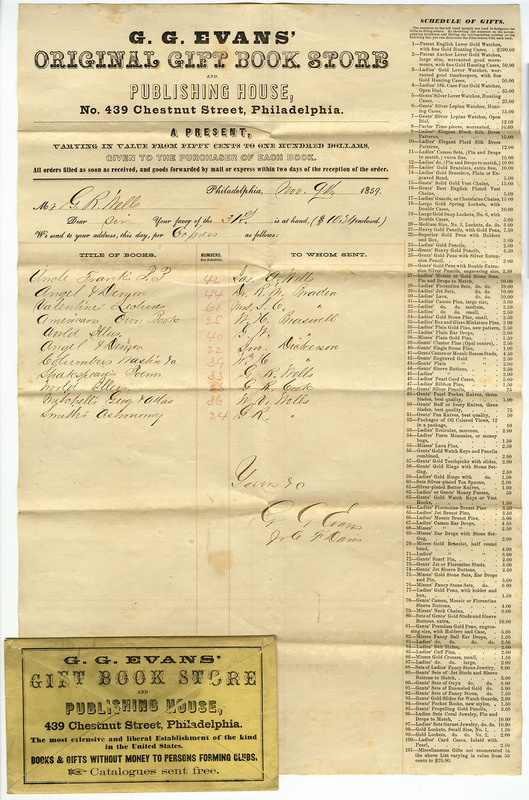 Evans’ Original Gift Book Store order form (Philadelphia, 1859). Gift of Wendy Woloson. G.G. Evans encouraged agents to form book-buying clubs and offered commissions of books and gifts, but not cash. In order to receive the commission of one book and a gift, the agent had to sell ten books. As can be seen here, G.R. Wells induced ten people, some of them family members, to order books. In the middle column are the gift numbers in red ink. 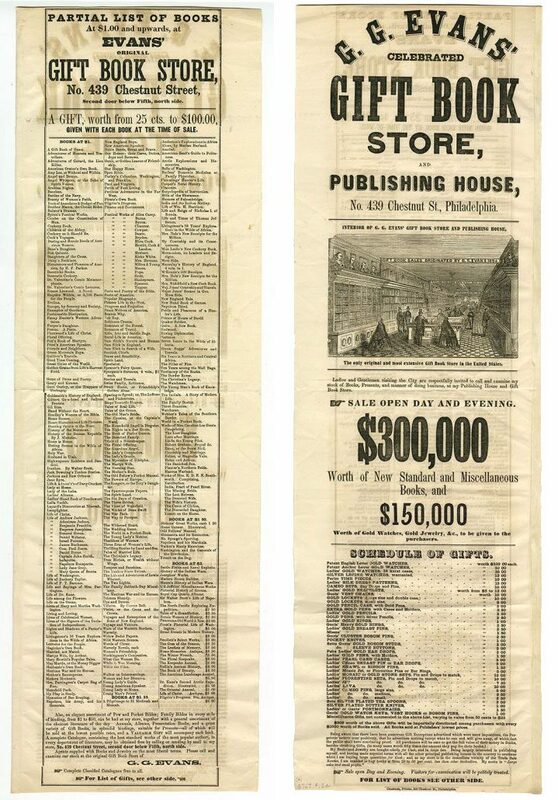 Late in 1856, New York publishers Leavitt & Allen placed an advertisement in the American Publishers’ Circular and Literary Gazette, a trade publication for booksellers. 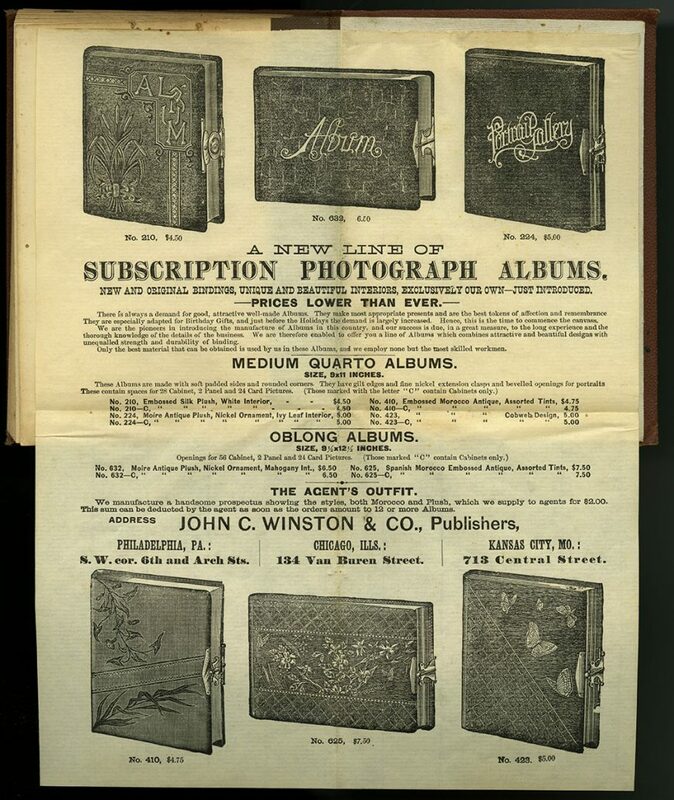 It listed the many “Elegant Gift Books and Annuals” and the different binding styles offered. The selection was remarkable. Some books were offered in as many as five different binding options. Though the prices are not listed here, these books ranged from $1- $10, about $27- $270 today. “Elegant Gift Books & Annuals for 1857,” advertisement in the American Publishers’ Circular and Literary Gazette (New York, December 6, 1856). Enlarged reproduction. Unidentified man posing with book (Philadelphia, late 19th century). Books were often used as props in photographs. The book in this man’s hand looks very similar to some of the books that Leavitt & Allen offered.